Naomi Cottle finds missing children. When the police have given up their search and an investigation stalls, families call her. She possesses a rare, intuitive sense, born out of her own experience, that allows her to succeed when others have failed. Young Madison Culver has been missing for three years. She vanished on a family trip to the mountainous forests of Oregon, where they'd gone to cut down a tree for Christmas. Soon after she disappeared, blizzards swept the region and the authorities presumed she died from exposure. But Naomi knows that Madison isn't dead. As she relentlessly pursues the truth behind Madison's disappearance, shards of a dark dream pierce defences that have protected her for so long. If she finds this child, will Naomi ultimately unlock the secrets of her own life? I loved it. Her language use and her deep seated understanding of how complexed emotions are. As I was reading I felt the fear, the pain and I wept. A marvelous insightful book that I read in one sitting. I could not put it down until I knew the heart rendering but satisfying end. Looking forward to my next read. 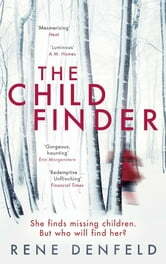 “The Child Finder” is the story about Naomi Cottle, an investigator with a high success rat in finding missing children. She once was a missing child herself and this makes every case hon works a personal one. I enjoyed reading this book and, even if it is intense and the subject matter did make me feel uneasy at times, I foud it very well researched and well written. I chose to read this book and all opinions in this review are my own and completely unbiased. Thanks to NetGalley and Orion Publishing Group! An amazingly inspired story which rings true and impossible to put down.